The summer of 1939 turned out to be the last summer of author Lucy Lipiner's childhood. On September 1, when she was six years old, her parents roused Lucy and her older sister from their beds, and with other relatives in tow fled their town of Sucha and the invasion by Nazi Germany . Their journey of survival was not easy, and in Long Journey Home: A Young Girl's Memoir of Surviving the Holocaust, from the perspective of that young girl, Lucy (Lusia) narrates her family's story. From her sheltered life in a small town at the foothills of Tatra Mountains to her time as a barefoot and hungry little girl in Siberia and Tajikistan in central Asia, and finally her arrival in America, this memoir shares the emotional details and the physical struggles of a ten-year flight to freedom. An extraordinary story of resilience, Long Journey Home is a detailed, historical account of a little known and rarely discussed group of Holocaust survivors. 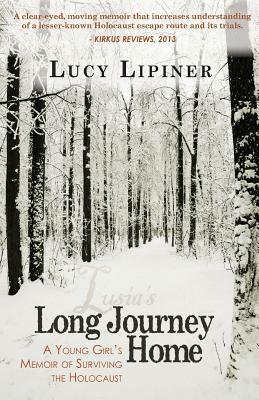 Lucy Lipiner was born in Poland and fled with her family at the outbreak of World War II. She earned a bachelor of arts degree from City University of New York and a master's degree from New York University. Lucy and Edward made their home in New York City.